(This property operates under City of Palm Springs TOT permit #17250000). Built in the late 1950's, your beautifully decorated accommodations combine the popular mid-century look with today's modern design. Amongst the mid-century touches you will find is our retro kitchen which is a replica of the kitchen used in Holly Golightly's (Audrey Hepburn) apartment in the classic film Breakfast at Tiffany's. Located in the non-windy south end of town and within easy access to downtown and all major attractions, your vacation home features Full Retro Kitchen, Private Patio, Modern Bathroom with glass panel and slate tile walk-in showers and glass vessel sink with stone counter tops, Flat Screen Televisions with DVD/CD Player, Laundry Facilities, Heated Pool/Spa, and Free Private Parking. Seeking a short week-end getaway (2 or 3 nights min), or looking to spend the season?, Our apartments are fully capable of providing for all of your vacation needs. Centrally located in the heart of Palm Springs, your new vacation home is within walking distance to downtown Palm Springs for shopping, museums, star gazing, and lively nightlife. Less than one mile away is Palm Canyon Dr. (Hwy 111) which is the main road that travels through the entire Coachella Valley with easy access to all major attractions. Other establishments such as grocery store, drug store, convenience store, video rental, liquor store, and much more are conveniently located near by to make your vacation stay as comfortable as at home while getting away from it all. Born in Havana-Cuba moving to the USA in 1969. Grew up mostly in the South Bay of Los Angeles County graduating from Mira Costa High School in 1975. Have lived in Manhattan Beach, Torrance, Long Beach, Bakersfield, and now Palm Springs. Hospitality has been my carrier since my first job just out of high school. Now enjoying life to the fullest and sharing a piece of Paradise with my guests. Being in the Hospitality Industry all my life I long dreamed of owning my own business where I could provide deluxe, comfortable, and personable but yet private accommodations for travelers from all parts of the world. Since the late 1970’s I often vacationed in Palm Springs where I always enjoyed the warm sunny weather and relaxing resort style atmosphere this wonderful town has to offer. The Mid-Century Modern architecture, majestic mountains surrounding the valley and historic Hollywood movie star flair are but a few features that makes Palm Springs like no other location in the world. When it came time to choose the destination for my dream I considered other locations like Hawaii and Key West, but the charm and location of this amazing desert city far outweighed any others I could have chosen. So, in 1996 I made the best decision I ever made in my life and chose Palm Springs to live out my dream. Since then my experience here has surpass my expectations and every day that goes by I continue to find new exiting things to see and do, and what a great feeling it is to share that with my guests! The central location of this property is one of the unique benefits you will enjoy with the ability to walk downtown for shopping, restaurants, entertainment, and the active night life that makes Palm Springs one of the most desired vacation destinations in the world. Additional benefits include having your very own full kitchen, private patio with outdoor gas grill, relaxing by the heated pool and spa, and enjoying the majestic views of our beautiful mountains which include hiking trails, waterfalls, and local flora. Built in the late 1950’s a recent renovation has incorporated the Mid-Century Modern architecture that was original to the building with modern touches such as flat screen televisions, slate tile walk-in showers with glass panel, rain shower head, glass vessel sinks and black marble counter tops resulting in a mix between history and today’s comfort necessities. Another very unique feature of this property is the original retro kitchen which is a replica of the kitchen used in Holly Golightly’s (Audrey Hepburn) apartment in the classic film Breakfast at Tiffany’s. The best unique benefit I can personally offer you is the most honest, personable, and friendly service in the Industry while respecting your privacy. I personally handle all aspects of my vacation rental apartments and look forward to being of service. Bathroom 1 includes walk in shower with floor to ceiling slate tile, glass panel and rain shower, glass vessel sink, and black stone counter top. Bathroom 2 includes walk in shower with floor to ceiling slate tile, hand held shower, glass vessel sink, and black stone counter top. We are located walking distance to Downtown Palm Springs where you will find shopping, restaurants, entertainment, and night life. We are in the heart of the world famous Palm Springs Resort Area where you can relax, golf, hike, shop, and play. Enjoy the view of our majestic mountains from the pool, courtyard, and other locations on your vacation rental property. Central heating and air conditioning included. Coin operated washer available in building. Coin operated clothes dryer available in building. One designated off street parking space is provided. 8 full sets of towels plus 4 pool towels are provided. Additional towels available upon request. Living room has ample space for visiting with friends or relaxing while watching your favorite film on the flat screen TV/DVD player. Sofa is a pull out sleeper sofa. Four burner gas stove with full size oven. Includes dishes, glasses, and all types of utensils. Full retro kitchen includes all you need to fix your favorite meals from a simple snack to a full dinner. Outdoor covered dining area in private patio makes great 'al fresco' dining with seating up to 6 people. Indoor dining area next to kitchen is cozy and romantic for up to 2 people. (2) Flat screen televisions provided. Cable television with basic channels is included. Available in living room and King bedroom. A collection of books are available for your reading pleasure. (3) A selection of classic films are provided including a 25th Anniversary Eddition of Breakfast at Tiffanys. Gardens are Desert landscape with several types of cactus and seasonal flowers. Private patio with covered outdoor dining area and gas grill included. Located just a few steps from your front door. Heated upon request, must allow minimum 24 hours advance notice to be fully heated. 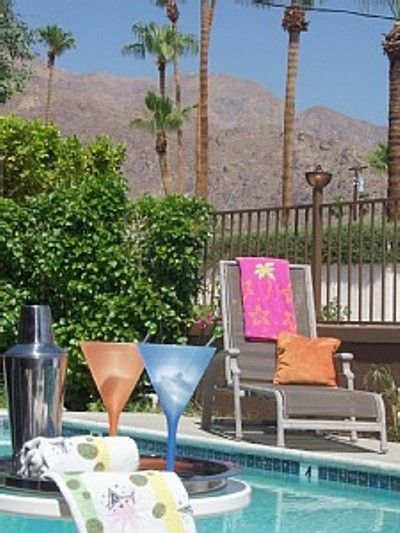 As the owner and operator of this charming vacation rental in Palm Springs I can guarantee you will receive my most undivided attention to make your stay a most memorable experience while respecting your privacy at all times. We had come out for the beginning of festival season. The place was very nice and had everything that was needed for our visit. The kitchen was well stocked and we had our own personal BBQ. We had steak and eggs one morning! Yum! The beds were comfortable and the bathrooms were very nice and modern. Jorge came to greet me when I arrived and was very accommodating. He let us know if we needed anything to just send him a text. The location was close to all necessary shopping. The only thing that I would have enjoyed more was more of a grounds.. A Grass area or common area to hang out in the sun. Overall, I enjoyed the property..
Vince and Linda were a joy to host. I enjoyed our conversations and appreciate their friendly smiles and how well they took care of my property. I look forward to their return in the future. This was our second time staying here and it continues as one of our favorite places to stay. Jorge is an awesome host. The 50s theme Breakfast at Tiffany's, is perfect for place and really adds an air of bygone days!! It is always a joy to host this group and I look forward to the opportunity to do it again. Thank you for the nice comments and let me know when you are ready to come back. Kid friendly, close to everything, accommodating! Enjoyed our stay! Had everything we needed, kid friendly, quaint and close to museums and restaurants. Jorge was available to answer questions right away and was very accommodating! Would definitely stay again!! Jayci and family were a great group to host. Well behaved children and took good care of the property observing all house rules. They are welcome back any time. Perfect setup for 4 people, quiet and Jorge is super nice. Beds were comfy and the little back patio was perfect for morning coffee. I love providing accommodations for my guests and when words like "super nice", "comfy", and "perfect" are used in their reviews it is extra rewarding. Clean, cute, close to town. Stayed here with family. Very cute condo, nice decor. Pool area was small and quiet. Onsite owner was helpful and friendly. Close enough to town to walk 20 mins each way. Would stay here again! Being onsite helps me tend to my guest needs in a prompt manner. Our location so close to downtown is one of the most appreciated features of our property. Your new vacation home is located near Downtown in the none windy South Area of Palm Springs, California. Made famous in the mid 1900's by Hollywood Movies Stars, Palm Springs was the place Marilyn Monroe, Frank Sinatra, Lucille Ball, and Bob Hope got away to play golf and drink martinis by the pool. Located less than 100 miles (2 hour drive) from Los Angeles, Palm Springs is still home to many stars in the entertainment industry. Local Movie Star Tours will show you where they live. Walk to downtown from your apartment and stroll through the sidewalks gazing at the Walk of Stars to find your favorite idol or shop at the many stores located in the Downtown Village. The mountain views are amazing. Ascend 2.5 miles to a pristine wilderness aboard the World's Largest Rotating Tram Cars and hike for hours amongst nature or enjoy the many other amenities available at the top. Golf, hiking, shopping, and a lively nightlife are but a few of the things to do here. Stays for more than 28 days do not pay tax. Rates are subject to change until reservations are confirmed. Payment schedule for monthly stays are customized based on length of stay and time of booking, please contact owner for details.